Nose Aromatic maltiness and subtle nutty toasted raisin notes. Palate A whiskey of considerable depth that interweaves dried fruit flavours with spicy oakiness. Composition Combination of Single Malted Whiskey. a 50:50 combination of whiskey matured for 19 years in a combination of oloroso sherry casks and bourbon casks, married together and then finished for over 2 years in madeira casks. 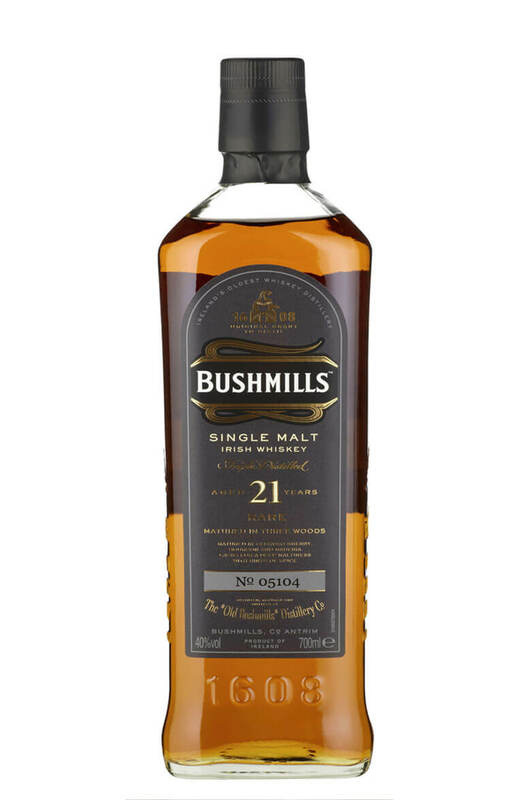 Serving Suggestion Bushmills malts are fantastic neat whatever the age. However, adding a drop of water helps release the aroma into the glass, really bringing to life the fruity spices. Obviously an ice bucket would have the same effect and make your Bushmills a tad cooler. Awards and/or Press Quotes Gold Medal - San Francisco World Spirits Competition 2009. Gold Medal & Best in Class - International Wine & Spirits Competition 2009.